Discussion in 'The Lounge' started by Toshi, Jun 27, 2012. Do you want a really, really bright taillight to get the attention of overtaking drivers when you're jetting about town on your bicycle? I certainly desired such a thing, living and bike commuting in Long Island and all. No good off-the-shelf options exist, unfortunately. The industry's current offerings are either cheap and weak (e.g. my 1W PDW RadBot 1000 with its ~50 lumens) or bright and ridiculously overpriced (see the $209, 300 claimed-lumen DiNotte 400R and the $259, 500 claimed-lumen DesignShine DS-500). Those latter prices are outrageous enough to begin with, but are even more galling given the existence of the $45 DealExtreme headlight that dante favors. Even after accounting for bald lying ("900-1200 lumens") and advertising material exaggeration inherent to an off-brand Chinese product, 600 lumens is quite possible per LED geeks. So I had a known, bright, cheap 600 lumen headlight and no good taillight options. What to do? The answer clearly was to rig something up myself! I took a DealExtreme SSC P7 LED headlight kit, a Tiffen #25 Red filter that I assume to block 25% of transmitted light per its name, and jerry-rigged a mounting setup to get it pointing backwards. The DealExtreme light, the subject of this post, is the one piggybacked atop the PDW RadBot 1000 below. Doesn't need moar shimz! Yes, that's a piece of wood that I threw in there to level out the light, along with a zip tie, random rubber bar shims from my toolbox, and the two OEM rubber bands provided with the light kit. Note the much larger lit mirror area and sensor-saturating brightness from the top DealExtreme light. If someone were to hit you if you had a regular taillight, they'll still hit you with that. If you were in my neighborhood... some haters might hit you BECAUSE of that light. I had a seizure. Your warning doesn't exempt you. Now all your things is mine. 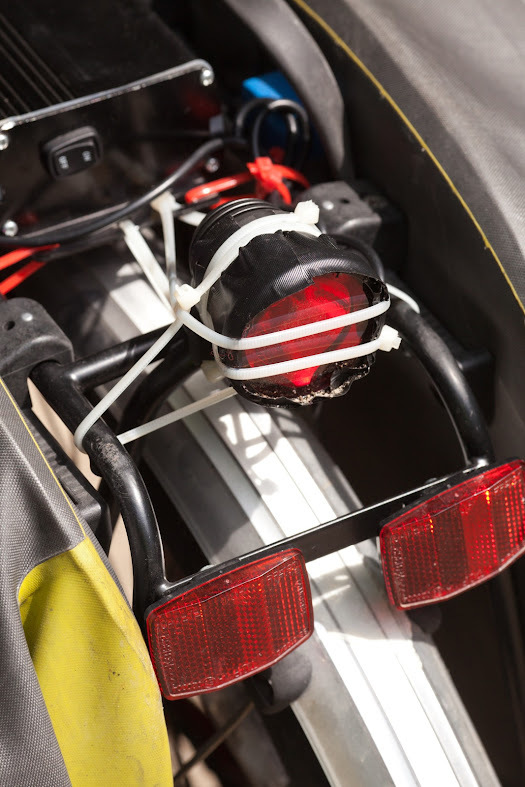 Geez I get drivers flashing their lights because of my front light, I think I'd be run down in no time if I had that contraption on my bike. It's cool that you made it but I think a couple of the Planet Bike tail lights would be more than enough for normal people. I won't run it in epileptogenic mode when it's dark out, of course, but that setting is just the ticket for bright days to compete with ambient light. I used it this morning (with another DealExtreme crazy-flashy light sans red filter as a headlight) and didn't get any comments, honks, or flashed high beams. Perhaps it was coincidence, too, but only one vehicle even came close to me while passing: an Isuzu lawn service truck with a trailer. i would run you over, just because of that. I've found that the more lit up I am, the better reaction/reception I get from motorists. Then again I live in The People's Republic of Madison and I don't have anything *quite* that garish as a tail-light. My DX headlight is usually pointed so that it illuminates the ground ~50' in front of me instead of pointed *at* them as well. Thanks for this idea! I'm trying a variation of this project, we'll see how it goes when my package arrives on Tuesday. I went with a very similar light, only a tiny bit cheaper and using a Cree XM-L T6 LED instead of an SSC P7 (XM-L T6 should be about 30% brighter at the same wattage). 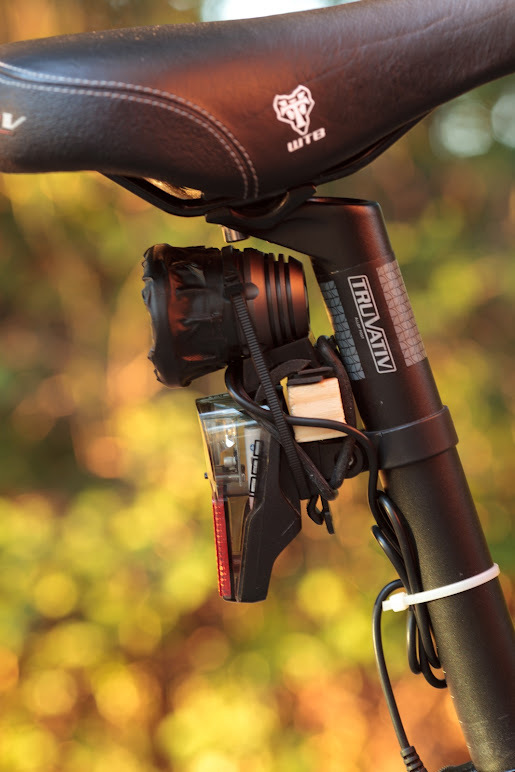 It includes a head mount, which is exactly the same as the helmet mount, only with larger straps: it's a square plastic base holding up a short horizontal tube (like a handlebar cross-section). You can see a pic of it on the Amazon page. The base has two rows of long, rectangular strap openings parallel to all four edges... I'm thinking this base (without the straps) is a perfect, no-fuss mounting (no-shims, no duct tape) mounting platform. Basically, I plan to vertically attach the base to my seat rails with a couple of zip ties passed through the openings. Then I can mount the light to the tube with the O-rings and it will adjust just as easily as if it were on a handlebar. I'll take photos and post when I'm done. FWIW, Tiffen photographic filters are all have numbers... they're model numbers, not related to % of light blocked. #25 is just the model of Tiffen's red filter. *If* that's the same one (XML T6 emitter) as I purchased from DX, it's even brighter than the P7 that Toshi posted (I have both). Let us know how the project turns out! Not sure how blinding drivers who are going to pass you is going to be very safe. In the day it's hardly blinding. 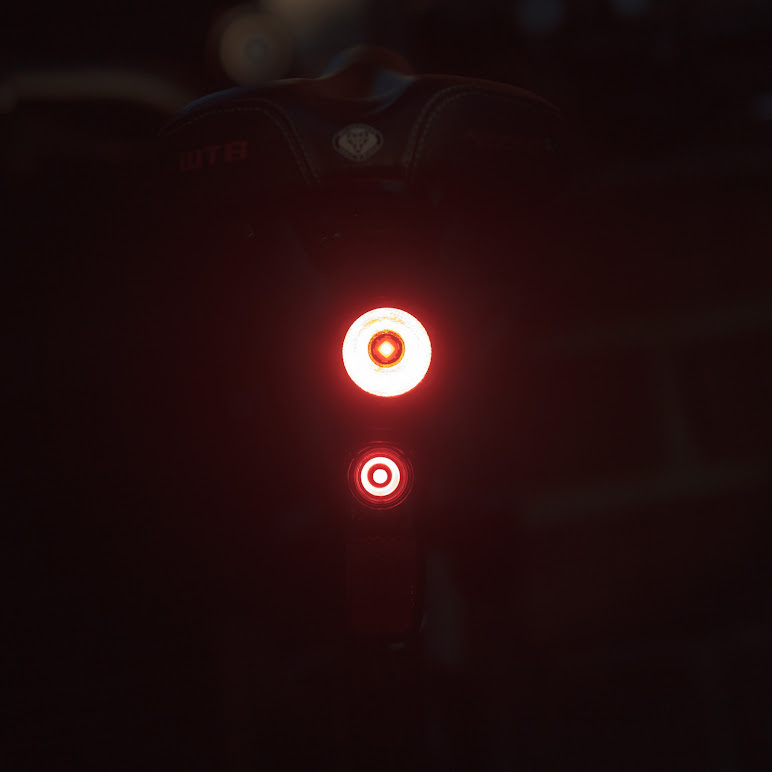 At night I turn the mondo-light to constant mode and leave the PDW RadBot on the seatpost in its intermittent flashing mode, expressly to avoid blindage. I'm with you on this one... my aim is daylight visibility, not blinding night drivers. During the day I'll use the flashing mode so I'm visible, and I'm planning to do some nighttime experiments (having my wife follow me in the car) to figure out the best option for night. I've assumed I'd be using one of the steady modes and aiming the light further down. My goal is a large pool of red around the tail of the bike, with my Planet Bike Turbo (mounted to my helmet) providing extra attention grabbing. Frankly, though, I'm going to err on the side of *my* safety... if my test run shows I'm not very visible from a good distance back, that light's getting tilted further up. After all, drivers don't HAVE to stare directly at my light... I can't plan my whole light strategy around what a driver might do if he's an exceptional idiot. As drivers we're used to poorly-aimed HID headlights, emergency vehicles lights, etc. -- and although the brightness can be irritating or jarring, we're generally able to avoid blinding ourselves and/or crashing as a result. If my effective lumens are somewhere south of HID/ambulance levels (can't imagine they won't be), then I figure I'm good. FWIW, I've done a good deal of bike commuting over the past 15 years, much of it along Central Expressway in the South SF Bay Area, where extra visibility, awareness of (and extreme caution around) the highest-danger spots, and even (when appropriate) causing a tiny bit of "driver confusion" are all good things. For example, the highest-danger areas along Central are the off-ramps... drivers sometimes assume that I'm planning to exit, so they'll pass me and cut in front of me as they exit. I keep an eye on my mirror for approaching traffic as I near the "mouth" of any exit, and if anyone's coming I'll start "karate chopping" my left arm straight out to the side, with the rhythm of a turn signal. Drivers aren't positive that I'm not about to cut completely into their lane, so they either merge into the left lane or they slow to give me extra space while they figure out what I'm doing... and the only thing they're 100% sure of is that I'm NOT about to exit. Other danger spots are on ramps and the parking lots of businesses, where drivers will for some reason begin to merge while firmly focused to their right... even though that makes no sense on a divided expressway, where the traffic (including me) is ALL coming from their left. In those cases I just light their entire cabin with my headlamp... invariably they slow or stop before turning to see what the hell is coming toward them. Basically, I've found that a well-timed touch of driver confusion can turn a dangerously-distracted or zoned-out driver into a focused and cautious driver in an instant. I posted details and photos of my version here, referencing this post, of course. Thanks for the help, I'm very happy with the result! See the full post for a few more pictures, including of the light beam. Yeah... I love zip ties where necessary, but if I can keep things a little cleaner I consider that bonus points. Hey, wanted to pass an update along: someone pointed out that Action LED has just started carrying a red wide angle lens! I spent a decent amount of time unsuccessfully trying to track just such a thing down before I went with the Tiffen filter idea from this thread! Grr. So that makes this now a $50 project, with only 3 things to buy: the $40 XM-L T6 light, the red wide angle lens (same price as the clear lens), and a dispenser of 5-minute epoxy! It has been about a year since my initial post about my spin on this mod, so I thought I'd post a follow-up. Reviewing the product links, I see the price of the light I used has dropped from $40 to $22, making this project only $35, vs. the $65 I initially spent! I wound up buying the red wide angle lens that's part of the current instructions, and removing the Tiffen filter that was part of the initial project... having one lens instead of two has definitely increased the light output from when I took the light beam photos here. 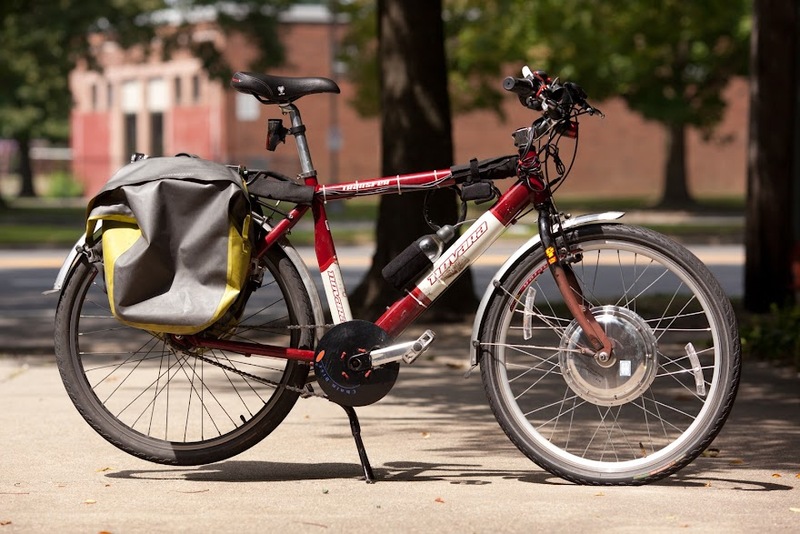 The 1yr report: I've commuted on my bike nearly every day, rain or shine, and have ridden through violent downpours without any incident or light interruption... the battery, charger, light and mounting hardware have held up with no noticeable degradation. I run the light in flash mode in daylight, and in solid (high power) mode when it gets dark. I can definitely tell I get a lot more space from drivers than I did before I installed the light, and I've gotten a decent amount of positive feedback from drivers and fellow cyclists. Most memorable was a pre-dusk exchange at a stop light, with a shuttle bus driver who'd pulled up in a right turn lane next to my bike lane. He grinned at me through his open window, so I asked, "Could you see me from pretty far back?" He nodded enthusiastically and said: "Man, you look like a frickin' AIRPLANE!" What a great discussion, it inspired me to try my own version of a super rear tail light. Along the way I found this item on ebay. It looks to be 1200LM Max output (can be dimmed), comes with red filter & bike clamp $20. bucks. The thing looks small to me. Cheap enough to experiment, I am going to try it out, will report results. Yeah, I like this idea. 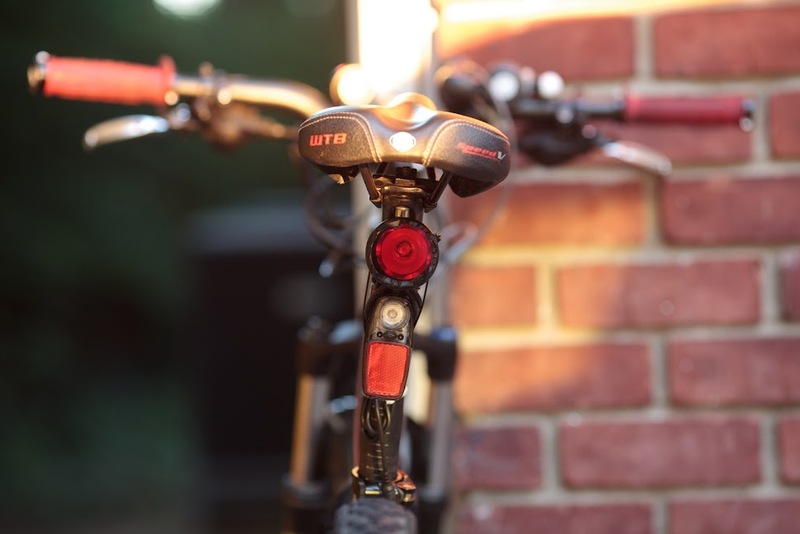 I also ordered some flashing LED valve-caps for my fatbike recently (available for Presta). They were much bigger than I expected, but since it's a fatbike and the tires don't really roll that fast it's working out fine. What I didn't expect is that they are not just one color, but like red, green, blue and yellow, and they transition to those colors and flash. They are movement-activated, but I have to be going fast enough on the fatty to activate them (they are going most of the time). I also have been toying with adding a more powerful laser to the front of my bike (since I got hit last week). 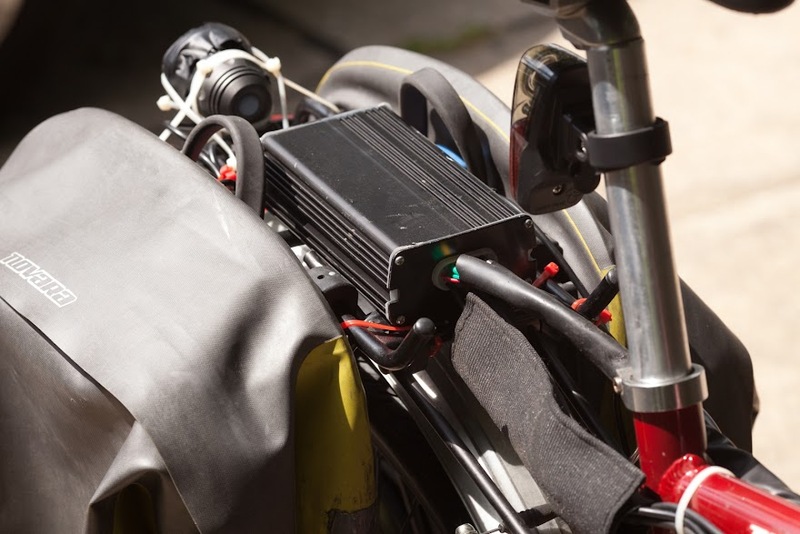 Been thinking of adding a quad .50 mount to the back of my bike, just to keep the jagoffs away...may be a bit heavy, but the peace of mind that comes with it is worth it. All them brake lights is gunna have them motorist seein Red! Found this on Reddit. Sort of want. That is indeed kind of cool. Well, three years after posting my twist on this thread, prices have dropped even further... Amazon lists one of these XM-L T6 light kits for $10, shipped, and the wide angle red lenses are down to only $5 shipped -- bringing the total cost for a new setup down to $15! (Plus $5 for epoxy if you're waterproofing the battery.) Albeit, the light ships from China, so you have to be willing to wait up to a month, but still, I have trouble understanding how such pricing is even possible. I'm now on a road bike and decided I wanted an under-seat bag, so I needed to figure out an alternate mounting method. I wound up placing the light on the top of the end of my rack (still attached to the de-strapped head mount). I did have to fashion a brace out of Instamorph (amazing stuff, a DIYer's dream) to keep it from sagging as I went over bumps. I've started participating in group rides once a week, then biking home afterwards, which means I'm running the light for 3+ hrs, some on flash and some on steady, and it's exhausting the battery. So I shelled out more money for one of these 2X larger battery packs, which has gotten me over the hump for my current usage patterns. Bonus is they're already waterproof, so no epoxying required.